Perhaps you’ve seen it around. Maybe you read that George Clooney likes it. You may have even seen Danny DeVito talking about it. Maybe you’ve tried it yourself, or if you have been to Italy, maybe you remember how it arrived after your meal, compliments of the chef. Limoncello is a delicious lemon-flavored liqueur that is often served after an Italian meal in order to aid digestion. The secret is that it’s delicious any time, and the best is often made at home. 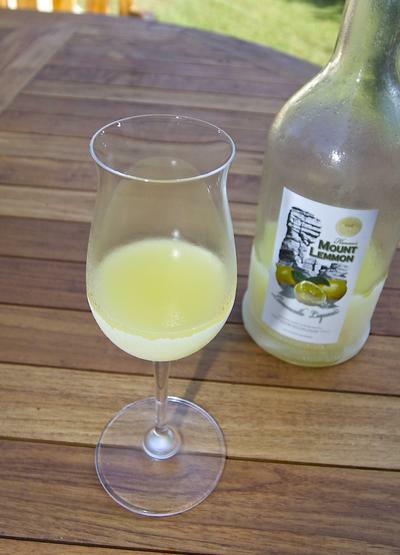 A proper limoncello has a creamy texture and is usually served neat, right from the freezer. It can be sipped or slammed and it goes great over ice cream. It is crisp, sweet, and refreshing. You could buy it, but most Italians make it themselves. It's not like you have to have to go all the way to Italy to enjoy great limoncello. Sure, you can go to Italy (and I recommend it) but you’d be surprised by what you can make right in your own home. The only traveling you will need to do is to make a short trip to Wisconsin. That’s right. If you live here in the Twin Cities, you need to visit our neighbor state in order to get the proper ingredients. Hey, it’s shorter and cheaper than booking a trip to Italy, right? So, what’s so special about Wisconsin? Well, for one thing, they sell 190 proof neutral grain spirits (Everclear). Here in Minnesota, Everclear is available, but only at 75% alcohol. Depending on where you live, availability may vary. In Arizona, for example, you can buy 190 proof Everclear in the grocery store! My recipe requires the strong stuff. Sure, you could substitute the weaker version or even vodka, but you would have to refigure the syrup with less water to compensate. And now I’m getting ahead of myself. . . So, you made the trip to Wisconsin and you bought a bottle of Everclear. Maybe you felt silly about it, maybe you were surrounded by cheering college kids. At least you could tell them you were making liqueur. Either way, you got what you came for. Now for the lemons. Organic lemons are a little harder to find and are sometimes small. If you opt for non-organic lemons, you'll probably need to scrub wax off of the rind and wash off any insecticide residue that may be present. Since we are only interested in the quality of the lemon peel, grab six or seven if they are small. After washing, the next step is to remove the zest from the lemons. I recommend using a Microplane grater for this, but a fine cheese grater will also work. You want to remove only the yellow part of the peel, not the white pith which is bitter. Once you have finished all of your lemons, take the grated lemon zest and place it in a canning jar or some other sealable container. Pour in two cups of 190 proof grain alcohol and seal the container. You will not need the rest of the lemons for this, so go ahead and make some lemonade or margaritas! As the zest soaks in the alcohol, it will release the essential oils and flavor into solution. Allow the zest to soak in the alcohol for at least three days. Give the jar a shake once or twice per day to mix it up. After three days or more, the zest will have released it’s lemony goodness.The solution should now be cloudy and yellow, while the zest has lost much of its color and has become brittle. It's time to remove the zest. Remove the zest from the solution by pouring it through a fine mesh strainer or cheesecloth. This should remove most of the zest, but I recommend filtering the liquid afterwards. Once strained, the yellow liquid will still contain tiny pieces of zest that could impart a bitter flavor and residue over time. At this point, I usually filter the liquid through a paper towel to remove the bigger particles and then through a coffee filter. The paper towel is an important step to save time since the coffee filter would quickly clog otherwise. Filtering this way takes a few extra minutes now, but pays off later in flavor and smoothness. Put your filtered lemon concentrate in a container and set aside for now. Place the sugar in a sauce pan and add the water. Bring to a boil over medium heat, stirring until the sugar is completely dissolved and the water becomes clear. Remove from heat and allow to cool. Be sure your syrup is cool before proceeding. A hot or warm syrup will cause the alcohol to evaporate. Combine the cool syrup with the lemon extract. As you do, the combined mixture will turn a pale and opaque. Once combined, your limoncello is basically finished. Pour it into a bottle and store in the freezer to chill. It will not freeze due to the high alcohol content. Limoncello can be enjoyed in shot glasses, fancy cordials or straight from the bottle! Once you make it yourself and understand how delicious and easy it is, you will want to make more for your friends. I like to give small bottles away as gifts or bring them to dinner parties. They make great holiday presents. Why not print up your own labels? Not satisfied with lemons alone, I have also made arancello which is the same thing only with oranges. Experiment. Share. Drink, and enjoy! Straining through a paper towel works? Never thought of that. Do you put it in a funnel or something? Ben, thanks for asking. I have seen your site and like what you are doing. Yes, I highly recommend the paper towel step. Previously, I had gone straight to coffee filters and found it to be incredibly time consuming—that led me avoid careful filtration altogether. Then, and I don't recall where I read about it, I started trying the paper towel step before the coffee filter. I simply fold the paper towel into a make-shift cone and set it into my fine mesh strainer. I think it drains a little faster in the strainer than it does in a funnel. Now that I am filtering, the resulting flavor improvement is totally worth this step. It makes the coffee filtration so much faster. I have been making Limoncello for over a year now, and I see that you remove the lemon rinds/pith and filter before you add the sugar solution. I do the opposite. I add the sugar water 45 days after letting the Everclear and lemon sit together. Then I leave it sit another 45 days. I then filter. The Limoncello I make is very clear and light yellow. I am curious to try it your way however. So, you only leave it sit for 3 days? When I first started researching recipes, I read a lot about long steep times, but practical science won over, and I still think it's the right way to go. Many recipes call for vodka, which is fine, but at only 80 proof, the flavor extraction takes longer. Since you are using Everclear already, there may not be much reason to go 45 days. 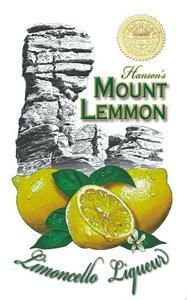 95% Alcohol will pull the lemon flavor very quickly, and micro-zested citrus gives up its essence in only a few days. Longer steep time doesn't seem to add more flavor in my experience and may even start to pull bitterness form the peel. I can't come up with a good reason why sugar would do more with flavor extraction than the alcohol. If anything, syrup dilutes the alcohol and slows the process. This again makes sense from a science perspective, but also from a practical one. As you are probably aware, filtering a syrup is a lot harder. By carefully filtering beforehand, you don't have to wait for thick syrupy liquid to pass through a coffee filter, whereas an alcohol solution moves pretty quickly. In other words, filtering a syrup tries your patience and may lead to shortcuts, leaving sediment and future bottle scum, not to mention bitterness over time. I hope you give my recipe a try. Think of it as achieving the same goals, just a lot less annoying. 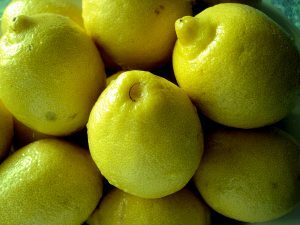 can you use Lemon Extract to make limoncelle? I am not familiar with a recipe for limoncello that uses lemon extract. I suppose it's possible, but you would have to add alcohol and then syrup. The point to remember is that limoncello is made from the peel or zest of the lemon and not the juice. I don't know what lemon extract is made from. Also, as the peel gives up its flavor to the alcohol, it forms the liquor base that combines with simple syrup to complete the liqueur. I can't imagine you would end up with good results by skipping that important flavoring step. Another way of looking at this is that we are trying to do what Italian families have done themselves for generations. Recent commercial bottles of limoncello are the shortcut. It's not about saving money or time—you do it from scratch to get better results. I'd say do yourself a favor and buy some lemons and leave the extract for some other project. Tried my first batch of lemoncello and it is bitter. Is there any way to save this batch or do I just learn from my mistake? Hmm. Do you know what you did wrong? A lot of people perceive the flavor of alcohol as bitter, and this stuff can pack a punch. Do you think you are tasting bitterness from the white of the lemons? I don't know that there is much you can do to remove bitter flavors, but is it making your creation undrinkable? There are a few key steps I follow to avoid bitterness. The first is getting only the YELLOW part of the lemon peel. Too much white and you are just adding bitter flavors. Second, I try to filter the resulting liquid several times as outlined above. The less sediment you retain, the less likely it will slowly contribute bitter flavors over time. Finally, I suppose it helps to find the best lemons. Sometimes you take what you can get, but I imagine some lemons have better flavors than others. You certainly want to use organic if you can get them to avoid wax and pesticides. We had a great time making (and, eslcliapey drinking) Limoncello & Mandarincello here in Antibes. We've spent enjoyable evenings doing taste tests with other friends who enjoy making it also. It's very popular down here and usually offered at the end of dinner parties, coming directly out of the freezer. Your entry has reminded me that we are due to make another batch. Thanks & Salut ! How much Limoncello does this recipe yield? Erica, the short answer is, just over a quart, but that's a little vague. The liquid ingredients add up to 4 cups, but the dissolved sugar does increase the volume of the water some. If anyone has a formula for that, I would love to hear about it. The other part of the equation is the alcohol. Depending on your zest, you may end up throwing out some liquid with the spent lemon peels. You want to keep that to a minimum, but rigorous filtration will also soak up some volume in the filters you discard. This loss is usually outweighed by the volume added in dissolved sugar, so you still exceed a quart. I'll try to measure the results next time I make some, but you can calculate the close answer as soon as you mix your syrup and measure it. I've made my first batch of limoncello and it is clear and not opaque. when I added my cooled syrup it didn't get cloudy. why aren't the lemons used as well as the peel? Interesting. I am not sure about the clarity--most of the batches I have made come out milky in appearance (light yellow, of course) but not clear. This happens when I add the simple syrup. I have always suspected that it's the result of lemon oils dissolved in the strong alcohol, and once you dilute that alcohol concentration with water from the syrup, it goes cloudy. I have seen plenty of commercial products that aren't as cloudy. Maybe it has something to do with the lemons. The important point is this: How does it taste? If the taste is fine, you shouldn't worry about the appearance. As for the rest of the lemon, think about lemon juice. It's mostly water and citric acid. These are simply unnecessary. The potent lemon flavor and aroma is concentrated in the peel, so that's why we use only the zest.